The holidays are swiftly approaching and it's the perfect time to stock up on holiday makeup sets for yourself or to give as gifts to others. I recently had the opportunity to test out a few of Pur Minerals new Holiday gift sets. 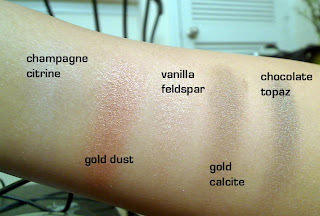 Swatches of celebrate, the eyeshadows on the left of the palette. 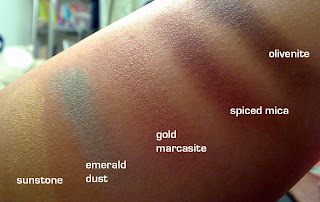 Swatches of Inspire, the group of eyeshadows to the right of the palette. For my contest this is what my email contestants will be winning! For $25 and 15 different eyeshadow colors, this palette is a really good deal. I actually like it more than the previous Paint by Numbers Palette that Pur Minerals released. My reasoning is that this time around the eyeshadows are grouped into clusters that coordinate really well. For instance, the Inspire Cluster (my favorite of the three) is perfect for a night-time smokey eye, while the Reflect cluster is perfect for a shimmery, neutral day-time look. It's almost like having three separate holiday palettes in one. 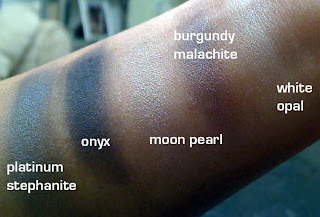 The swatches were all done without a base. The Neutral cluster in the middle doesn't show up as pigmented but it still shows well on the eye. This really makes a great starter kit or a gift for someone you love. Just make sure to wear a good base underneath if you want the colors to pop. With this trio, you get three glosses for $25 which isn't a bad deal at all. I was pleasantly suprised by this set. The colors are all super smooth and well pigmented. My favorite is Sheer Crystal, a pretty baby pink color. It's perfect for a pretty pink lip. 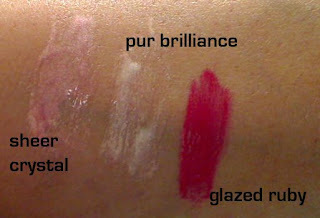 Pur Brilliance looks white in the tube but it's actually as an irridescent pink shimmer that would look great on top of a favorite lipstick. Glazed Ruby really suprised me of how pigmented it came out. It reminded me of a gloss version of Port Red lipstick. It's a great color to have for the holidays. 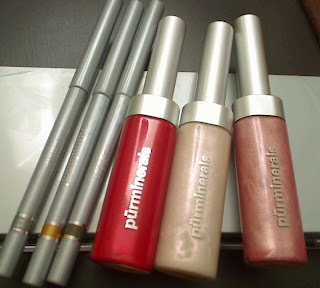 Again, I like this better than the previous lipgloss I tried from Pur Minerals. In comparison with the last Lip Plumping Pur Minerals Gloss I tried, this one had a very subtle yet pleasant vanilla scent. 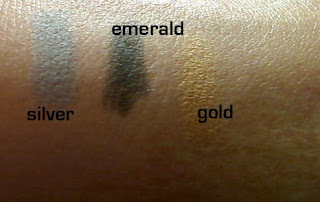 For $18.50, Pur Minerals offers a trio of eyeliners reminiscent of popular jewel tones for the holidays. They are retractable pencils which go on really smooth. Unfortunately, the only one that really showed up on me was Emerald. The others kind of blended into my skintone. This would probably work more so for the fairer skinned beauties out there. Like I mentioned, these would make great stocking stuffers. Each set is $25 or under. You can find these at http://www.purminerals.com/. Make sure to also check out their beauty blog for more tips and tricks. Those eyeshadows are soooo pretty! You're putting me in a make-up buying mood. That Gold Dust looks perfect! I think I just may have to get this, 15 colors for $25, the colors look so worth it. BTW, what is a good base for eyeshadow? I've never really used them. I like those colors Ren! hmm i wanted to try purmineral pressed foundation but it contains BISMUTH O. Like BARE MINERALS which was really bad for my face... but so much good reviews.. i dont get it! lol wut do u use for ur face?